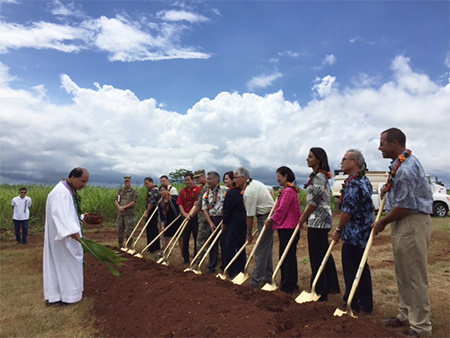 Hawaiian Electric and the U.S. Army broke ground on a new power plant at Schofield Barracks that will strengthen the island's power grid and improve integration of renewable energy. HONOLULU, Aug. 22, 2016 - The U.S. Army and Hawaiian Electric Company today broke ground on a new power plant that will strengthen Oahu's electric grid, make it more reliable, and improve the integration of renewable energy resources, such as solar and wind power. The 50 megawatt (MW) plant will be constructed on approximately eight acres of land at Schofield Barracks that the Army is leasing to Hawaiian Electric. The plant will be developed, owned, and operated by Hawaiian Electric. It will run on a mixture of biofuels and conventional fuels and is expected to be operational by spring 2018. "We appreciate the Army's commitment to renewable energy and to our island community. By working together, we are taking another step towards a more secure and renewable energy future for Hawaii," said Alan Oshima, Hawaiian Electric president and CEO. "Secure and reliable access to power mitigates risk and allows the Army here in Hawaii to carry out critical missions and support surrounding communities," said Honorable Katherine Hammack, assistant secretary of the Army for Installations, Energy and Environment. "This proposed project is a key contributor to Army readiness and resiliency." The energy generated by the plant will feed into the island's electric grid and serve all customers on Oahu. In the event of an emergency, it will be able to isolate itself to Army bases, if necessary, to provide reliable power to the Army's facilities in Central Oahu, including Schofield Barracks, Wheeler Army Airfield, and Field Station Kunia. The Schofield plant will strengthen the Oahu grid and make it better prepared for emergencies. It will be the only power plant on the island located inland, away from any coastal impacts from storms or tsunami, and will be well protected on a secure Army base. "We're excited about the benefits of this partnership for the Army and local community," said Col. Stephen Dawson, commander, U.S. Army Garrison-Hawaii. "In keeping with the Army's commitment to protecting the environment, we know this plant will provide the energy we need while, at the same time, being good stewards of our natural resources." The plant will feature modern, flexible and efficient generators that will complement increasing levels of solar and wind power on the Oahu grid. The generators will be capable of quickly starting up, shutting down, or changing their output in response to sudden changes in solar and wind energy resources, which provide varying levels of energy depending on weather, time of day, cloud cover, and other factors.